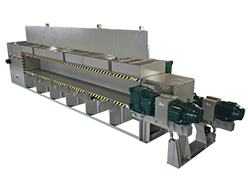 Republic Machine’s patented Zoidal cutting system prevents wrapping and reduces frictional heat when shredding carpet, plastic film, and fiber. This ‘thru hardened’ tool steel cutter is superior to others for film cutting and fiber reduction. The cutter geometry, counterknife geometry and tight tolerances do not allow film or carpet to wrap around the rotor, increase heat, or slow or stop production. The cutting system increases productivity and consumable cutter/counterknife life. Our cutters and counter knives are fully adjustable, reversible and resharpenable – reducing your cost of consumables even more. 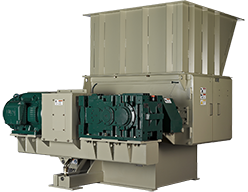 For less demanding non-wrapping solid products, models can be manufactured with the durable Hawksbill cutting system. 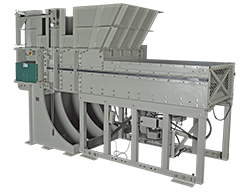 Republic Machine applies its innovative engineering to the design of many screens that enhance a system’s cutting performance. We offer standard round-holed screens, patented grooved screens, triple cut screens, and close tolerance, square-holed screens.